Namibia, known for its stark, dramatic and timeless landscapes, is truly a diamond in the rough and one of southern Africa’s best kept secrets. 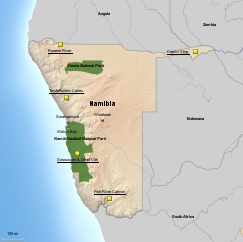 Namibia is situated along Africa’s most inhospitable coastline to the northwest of the Republic of South Africa. Namibia takes its name from the 130 million year old Namib Desert, which uniquely harbors elephant, rhino, lion and giraffe. Namibia is a land of contrasts with towering sand dunes, shimmering plains, sunshine, mountains, gorges, valleys, and the starkly beautiful “skeleton coast”. From the abundant game and bird life to the diverse fish and seal population on the coast, Namibia offers something for everyone. Highlights include some of the highest sand dunes in the world at Sossusvlei, unique cultural experiences with the Himba and San Bushmen; Big 5 game viewing at Etosha National Park. Namibia is like no other country in Africa, offering visitors an intense encounter with nature, the environment and wildlife. Location: Namibia is in Southern Africa bordering the South Atlantic Ocean, between Angola and South Africa, with Botswana to its east. Population: Just over 2.3 million people live in Namibia. Languages: English is Namibia’s official language but the first language of only around 7% of the population. Afrikaans is actually the most common lingua franca spoken by Namibians, including about 60% of the white population. German is spoken by around 20% of the population. Indigenous languages include Oshivambo, Herero and Nama. The Flag: The Nambian flag was adopted when the country gained independence from South Africa in March, 1990. The colors were mostly based on the SWAPO flag, the most important liberation movement at that time. Currency: The Namibian Dollar (N$: NAD) and South African Rand (ZAR) are both legal tender in Namibia. Getting to Namibia: Most visitors will fly into Hosea Kutako International Airport in Namibia’s capital Windhoek (WDH). There are no direct flights to Namibia from the US. South African Airways and Air Namibia service Windhoek daily from Johannesburg and Frankfurt respectively. Books: The Sheltering Desert – Henno Martin; An Arid Eden – Garth Owen-Smith; Skeleton Coast – Amy Schoeman; An Elephant’s Life – Caitlin O’Connell; A History of Namibia -Marion Wallace. Movies/Documentaries: The Guardians – 2014 conservation documentary by Jenny Nichols and Andy Maser; Namibia: The Struggle for Liberation (2007). Namibia’s Central Highlands are dominated by its small, German style capital, Windhoek. Set at the geographical heart of Namibia, it serves as the major road and rail crossroads and is the country’s business and commercial operations center. Windhoek has a population of only 130,000 people, but Namibia’s ethnic mix is reflected on the streets of this town. Most safaris whether overland or fly-in originate in Windhoek, which offers large, resort style hotels or smaller bed and breakfast type accommodation. Sossusvlei is one of the most remarkable sights in the Namib-Naukluft Park and the Namib Desert. Huge towering dunes, said to be the highest in the world, rise dramatically over 1000 feet above the surrounding plains at Sossusvlei, a huge pan set amid red sand dunes. The spectacle of changing colors and the lonely oryx silhouetted against the red dunes is one which visitors and photographers from around the world come to savor and capture on film. At any time of the year you may observe gemsbok and ostrich wandering over the sand. This vast expanse of dunes stretches from the Khoichab River in the south to the Kuiseb River in the north. It’s likely that this sand originated in the Kalahari between three and five million years ago. Although it’s certainly a workout, the best way to get a feeling for this sea of sand is to climb one of the dunes and have a look around. Damaraland is the mountainous region in northwest Namibia inhabited by the Damaras and named after them. Originally, it was an area occupied primarily by the Damara people, but it soon became the home of other tribes such as the Hereros and the displaced Riemvasmakers of South Africa. The name Damara is derived from the Nama word “Dama”, meaning “who walked here”. This is because the Damara were known to the Nama people by the footprints they left around waterholes. From their vantage point in the mountains, the Damara were quick to spot resources, such as water or animals, on the plains below, and they were therefore able to be the first groups to reach these essential resources. Damaraland’s attractions include: The Brandberg, a massive mountain which shelters thousands of rock paintings; Twyfelfontein, which has some of the best rock engravings depicting wildlife scenes; as well as the Petrified Forest and Burnt Mountain. Damaraland Wilderness Preserve rewards the patient, and lucky, visitor with glimpses of the unique wildlife that survives here, including desert elephant, black rhino, lion, desert dwelling giraffe and Hartman’s mountain zebra. With palm-lined streets, seaside promenades and some first class hotels, Swakopmund enjoys its place as Namibia’s most popular holiday destination. A friendly and charming town with a distinctive old world German atmosphere, it welcomes all travelers to its shore. There is an abundance of flower gardens and half-timbered houses as well as other colonial era structures but it’s the wind blown sand and the palm trees that are distinctive of Africa. Situated north of the coastal town of Swakopmund, the Cape Cross Seal Colony supports up to 100,000 Cape fur seals and is an active and important breeding ground and popular excursion. Etosha National Park is Namibia’s premier nature reserve and one of Africa’s largest. It has great concentrations of game, especially in the dry winter months, and there are wonderful views out onto the saltpans. It protects 114 species of mammals along with 340 species of birds. Originating as a shallow lake, the Etosha Pan dominates the park and is an immense, flat, saline desert of more than 3500 square miles. Now, in years of good rain, this depression becomes a temporary lagoon full of white pelicans and flamingos. Birdlife around the waterholes is good, with ostrich, pygmy falcon and all the raptors in abundance. Some of the local “specials” include short-toed rock thrush, Hartlaub’s francolin, freckled nightjar and Meyer’s parrot. Famous for its large herds of elephant, Etosha is also home to lion, leopard, black rhino and all of Namibia’s plains game including springbok, gemsbok, and hartebeest. The Skeleton Coast is one of our planet’s most beautiful places. Over much of the past decade, access to this private area within the National Park has been restricted. However, nearly 660,000 acres of the National Park have been set aside as an exclusive safari experience for those who want to really get away! It is wild, desolate and uninhabited…and stunningly beautiful. The area has everything, from soaring sand dunes that roar, wonderful vast, pastel colored plains, towering canyons and mountains, salt pans to seal colonies to ship wrecks. This coastline is so named for the many skeletons of shipwrecks and whales that dot the treacherous coast of this park. The freezing Benguela Current of the Atlantic sweeps up from Antarctica and meets the hot dry air of the Namib, resulting in thick morning fog, which blankets the region. This unusual weather condition brings life-giving moisture to an otherwise arid land and sustains a host of desert animals. Fresh water springs permeate the barren sands to create rare oases in the desert that sustain pockets of wildlife. Springbok, gemsbok (oryx), the rare desert elephant, Cape fur seals, brown hyena, jackal, ostrich and occasionally even cheetah eke out an existence in this rugged terrain, alongside the desert-adapted vegetation such as the ancient Welwitschia plant and Lithops, the succulent “flowering stones”. You are also able to visit authentic Himba settlements, just outside the park, for an incredible cultural experience. At 35,000 square miles in size, the Namib-Naukluft National Park is one of the largest and may be the world’s oldest desert. The prehistoric Welwitschia plants are testimony to its age and give us a glimpse into the adaptations plants and animals make in an extremely hostile environment. Areas of interest include Walvis Bay and Sandwich Harbor just outside the park on the coast, the “Moonscape” of the Swakop Canyons, Sesriem Canyon and Sossusvlei, where one will find the highest sand dunes in the world. The Naukluft mountains offer massive rock formations and heavily vegetated riverbeds where Mountain zebra, springbok, kudu, rock rabbits and Black eagles are frequently seen. Waterberg Plateau Park covering 156 square miles, is home to several scarce and endangered species, including black rhino, white rhino, roan antelope and sable antelope. Other animals seen in this area include eland, tsessebe, brown hyena, oryx, kudu, klipspringer, and occasionally, leopard. Visitors to the Waterberg Plateau Park will also come across unique flora along with rock paintings and engravings. Three trails lead up to the top of the plateau, which rises over 820 feet above the surrounding plains.